There is nothing harder for people than trying to change the trajectory of their lives after it had been set one way for so long. Whether it’s recovering from an addiction, leaving an abusive partner, or simply having a difficult life with difficult choices, making legitimate change for oneself to make their life better takes incredible strength and willpower. However, having a helping hand and the support of others contributes greatly to that journey, no matter what set them on the path they were on. For a group of men out in Tulsa, Oklahoma, the story they are leaving behind is homelessness, and they are doing it through good works and taking care of honeybees. The land used for the program resides in western Tulsa, which the John 3:16 Mission bought several years due to its proximity to its refuge location. While the land was not initially bought for beekeeping purposes, that changed when a local offered to donate a free bee hive to the mission. Reverend Steve Whitaker, who serves as the mission’s senior pastor as well as its CEO, found out how he could make the hive and the program work together cohesively. He even discovered that the men in the program wanted to learn more about the honeybees and beekeeping itself. With the vocational program currently running strong, the men, per Whitaker’s account, are learning various skills and practices. 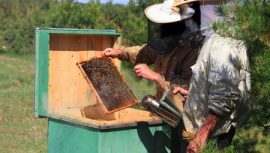 “People are learning how to deal with the problems associated with working through a beehive, as well as standing out in the heat,” Whitaker said. “They had to get up, had to get dressed, had to show up this morning, and those are skills they have got to have to work for some of the wonderful Tulsa employers that we have.” The recovery program is expected to expand, with the inclusion of livestock like cattle and pigs on the land as well as crops for the men to grow and harvest themselves. The honey that Wells and the rest of the program harvest from their hives will be sold in the next few weeks, with a portion going to the mission and the rest going to them. Hopefully, more men can experience the benefits of beekeeping, creating a new path for themselves as well.